Maybe the name Carmen Martín Padial says you something. He held the second place on the list of Lleidas Hartos.org during the last Catalan elections. A vegetarian and an animalist, you may have noticed his unconventional speech. Maybe you have also heard about collecting of food and toys for the most poor which are usually organized by the Igualada group. A good initiative in times of crisis, right? What they do not say is that only the “Spaniards” can benefit from collected items. Behind the initiative of Igualidad and the deceptive speech of Padial the same initials are hiden: MSR. Movimiento Social Republicano. A neo-fascist party founded in 1999. And behind the facts and the words of this group of extreme right, who proclaims “national revolutionary” (NR) lies the desire to capitalize the crisis with a message that combines racist and xenophobic elements with other elements of social order. This is not something new: the MSR, using a strategy developed by the Italian Fascists and German Nazists, when, in the inter-war Europe, marked by economic, social and political crisis, they combined the discurs of revolutionaries and workers and those of nationalists and xenophobes. It is important to remember that Benito Mussolini was the leader of the Italian Socialist Party and its newspaper before creating fascism. And the last bastion of his regime, in the time of the fall of the dictatorship in 1943, was the Social Republic of Salò. Also, one of the first leader of the German Nazi Party (National Socialism), Gregor Strasser, who was murdered on the orders of Hitler in 1934, stood for workers’ and revolutionary discourse. 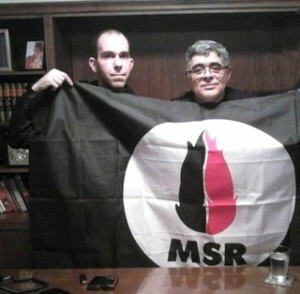 The members of MSR have links with Fiamma Tricolore, the Italian party that until today, always uses as its emblem the flame that served as a cout of arms for the Republic of Salò. And they proclaim “strasseristes.” Especially when the chief of MSR, Juan Antonio Llopart has a publishing house, Ediciones Nueva República, which publishes biographies of the Nazi. The connections between the MSR and the historical Fascism and Nazism are undeniable. But we don’t need to look to the past to discover that, as today, behind the unconventional and revolutionary social mask, the MSR is hiding fascism and hate speech. Llopart was released and his publishing house continues to function as the Supreme Court annulled in 2010, a sentence ofthe Provincial Court of Barcelona. It was recognized that his books, found in the Kalki library, also defended genocidal ideas. Once relaxed, Llopart has continued to organize events such as Days of Dissent, which is celebrated evry year in Madrid by the study center of the MSR, CELE. 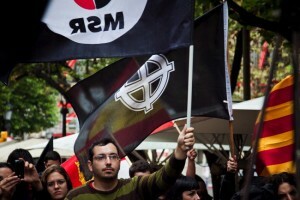 In its final edition, in November 2012, they argued for an example of Pedro Varela (him, who on contraty, was condemned of incitement to hatred in his books sold in the bookstore Europa in Gràcia (popular area of ​​Barcelona) and for members of the Golden Dawn, openly Nazi party who grew up to get a good number on deputies in the parliament, following the crisis in Greece. Members of the Blood and Honour, an umbrella organization of pan-European neo-Nazis through the Rock Against Communism (RAC), a music with numbers of ultras, was less lucky. They organisation is prohibited in various European countries likes Germany and Spain. In the latter, it was banned in 2011 by the Spanish Supreme Court, which sentenced few times 14 of its members for illegal association and posessions of weapon. Among 19 accused, 14 were included in the lists of MSR in 2004. It was one of the rare occasions in which the MSR stood for election. Luckily, they had poor results: they have only a municipal advised in a village in la Mancha with 200 inhabitants, Heras de Ayuso. When Martin Padial took the head of the MSR, in the last European elections in 2009, it obtained 6,009 votes for a total of 0.04%. Because his message of hate is always ignored, even in times of crisis, we must unmask the seemingly social and revolutionary discourse. All in all, MSR is a Nazi group. Posted on May 14, 2013, in Europe and tagged Neo-Fascism, Spain. Bookmark the permalink. Leave a comment.